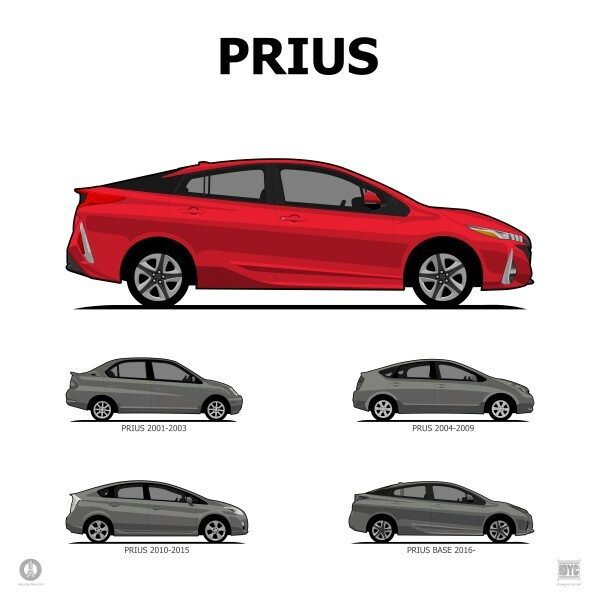 Original vector artwork illustrated in painstaking detail using Adobe Animate and carefully composed using Affinity Designer. 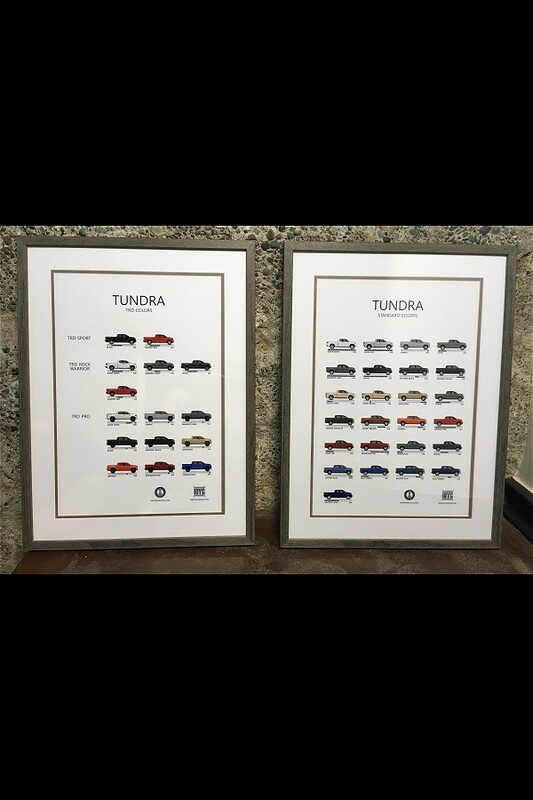 Posters are printed by a Portland-local partner on an Acuity 1600 LED digital press using heavy paper stock and archival-quality ink. 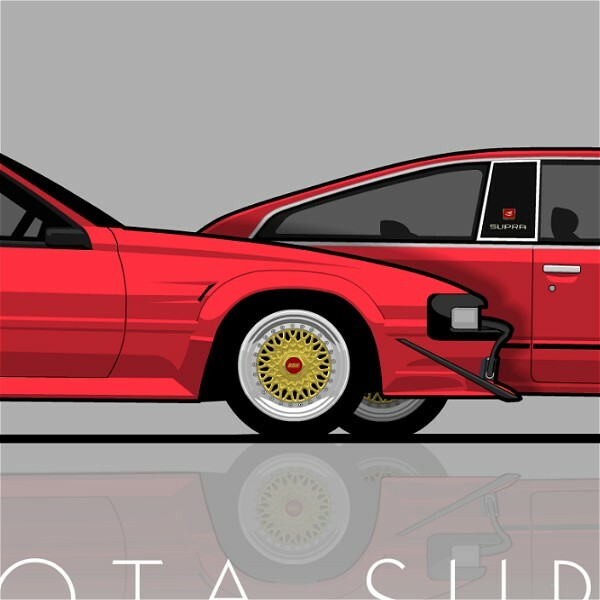 USPS shipping is free within the US. 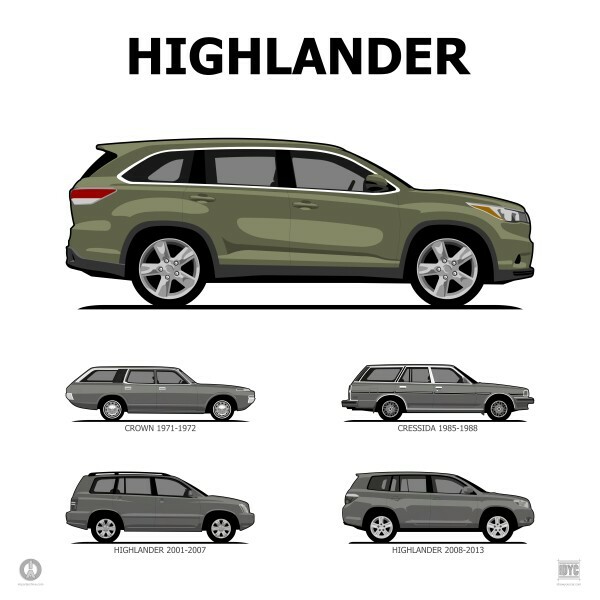 Prints and posters do not include frames and will arrive in a recyclable mailing tube. 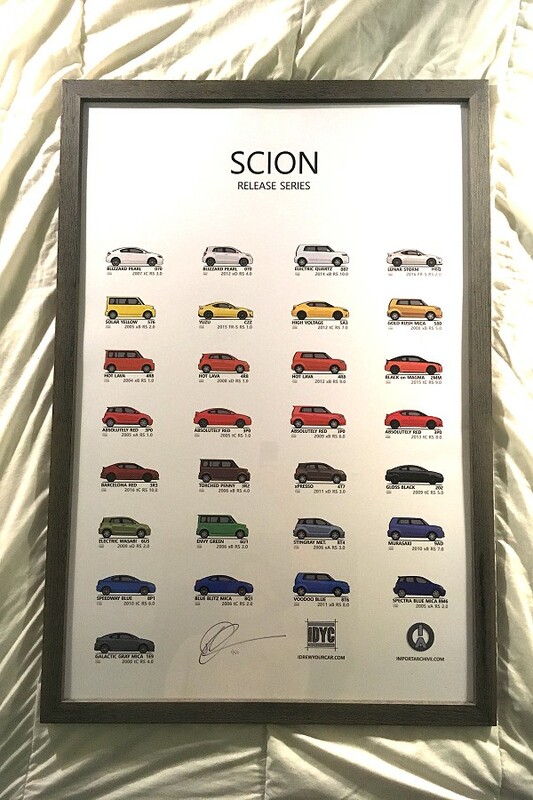 All of my posters are signed limited editions. 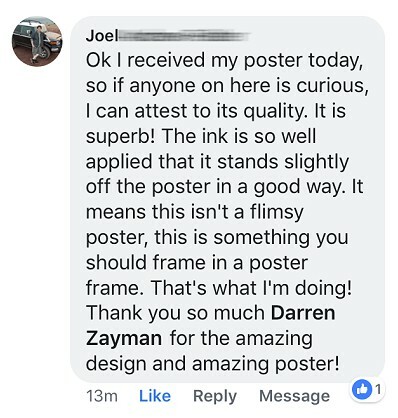 I send out a periodic email alerting my fans when new posters become available. 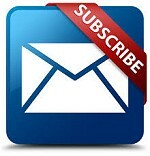 If you're tired of missing out on your favorite art, sign up for the mailing list and never, ever be disappointed again. 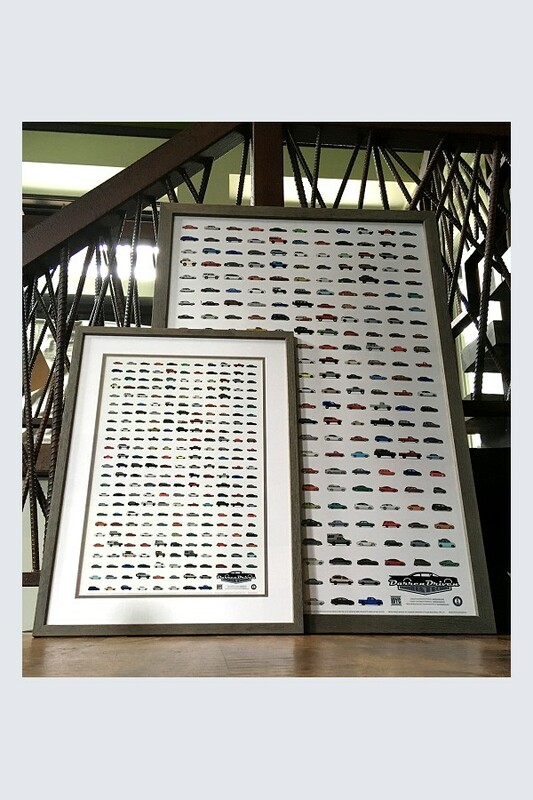 These ain't no flimsy cheapo posters! 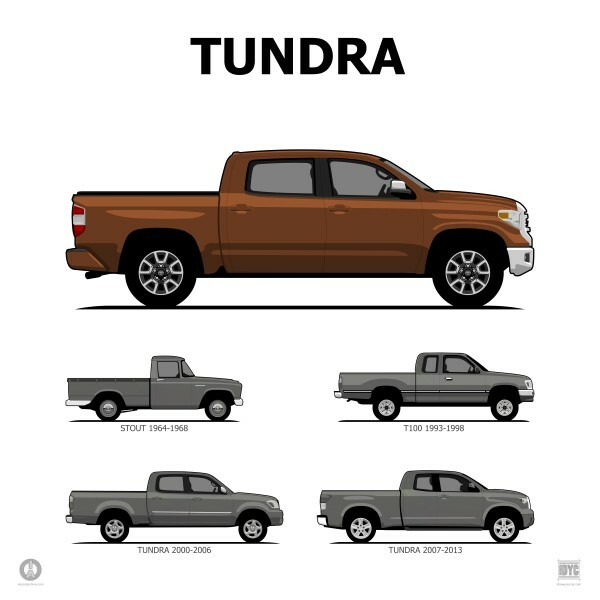 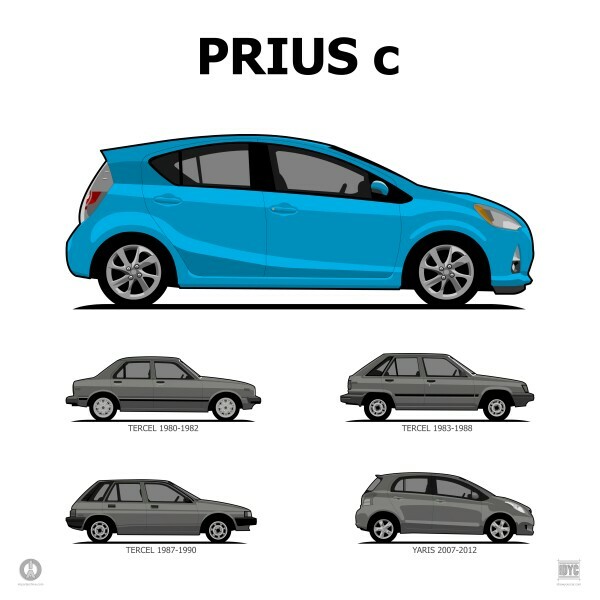 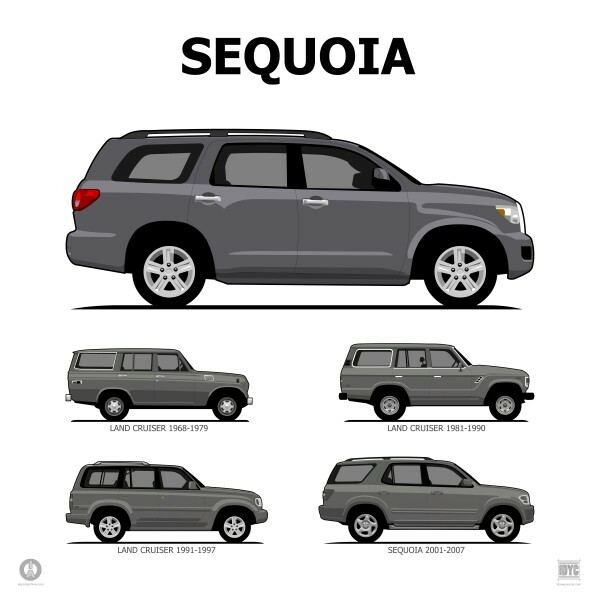 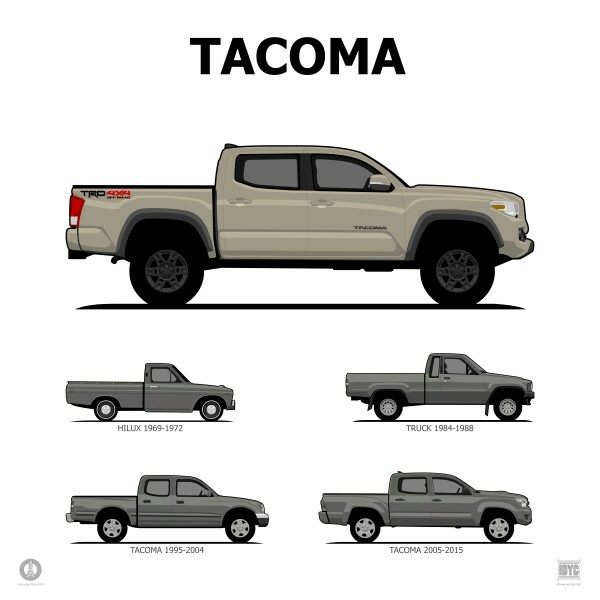 Each of the illustrations represent a unique body variant sold by Toyota in the US since 1958. 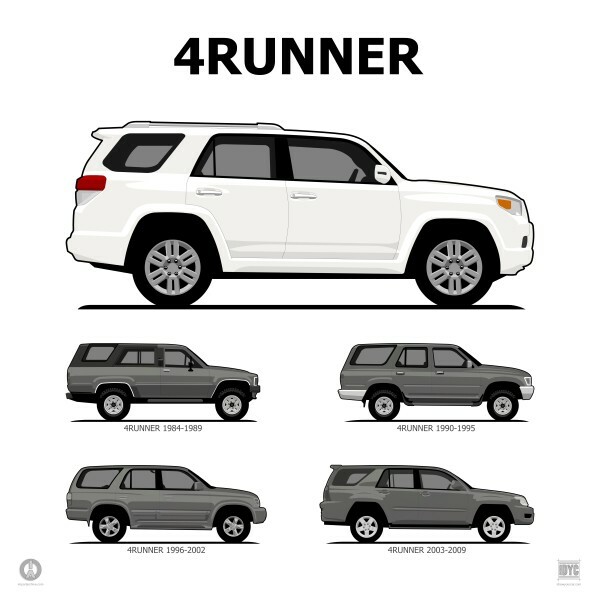 Have fun spotting variants like the ultra rare RS26LV Crown Custom 2-Door Wagon or tiny Scion iQ urban commuter, to the fun 1981 Toyota Trekker or luxurious Lexus SC430 hardtop convertible. 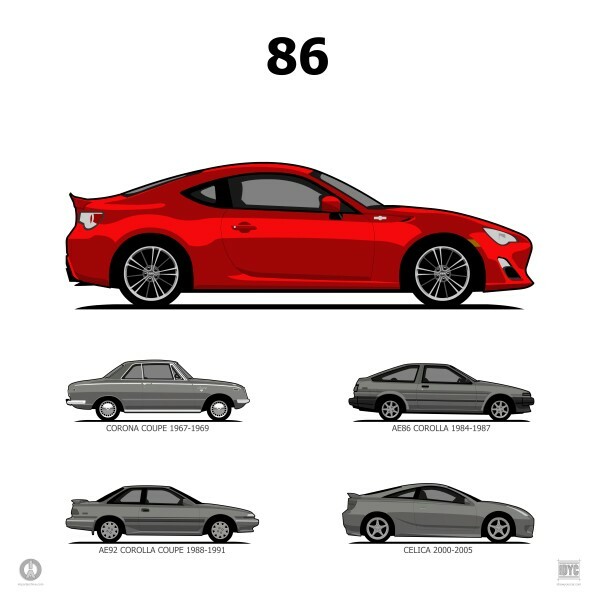 Attention to every meticulous detail in each illustration results in this masterpiece of automobilia that any true Toyota enthusiast should not go without. 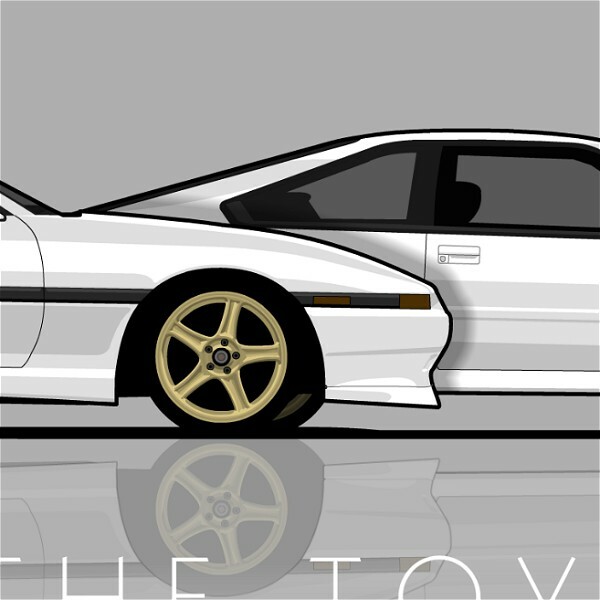 IN STOCK / ON SALE! 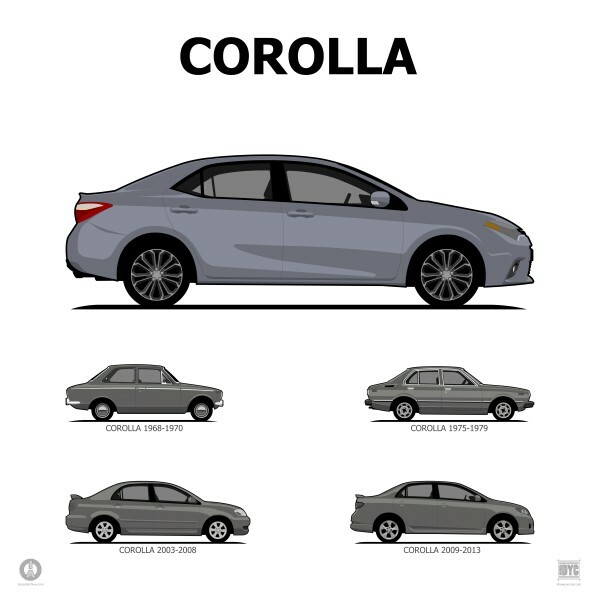 Added: Corolla Sedan? 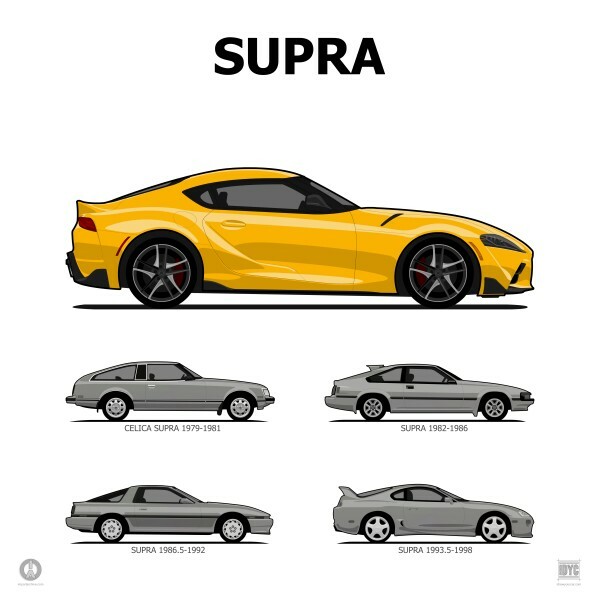 Supra? 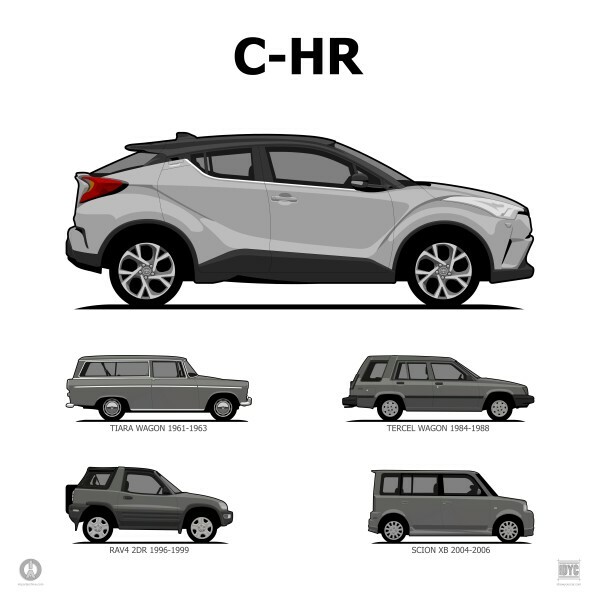 Lexus UX? 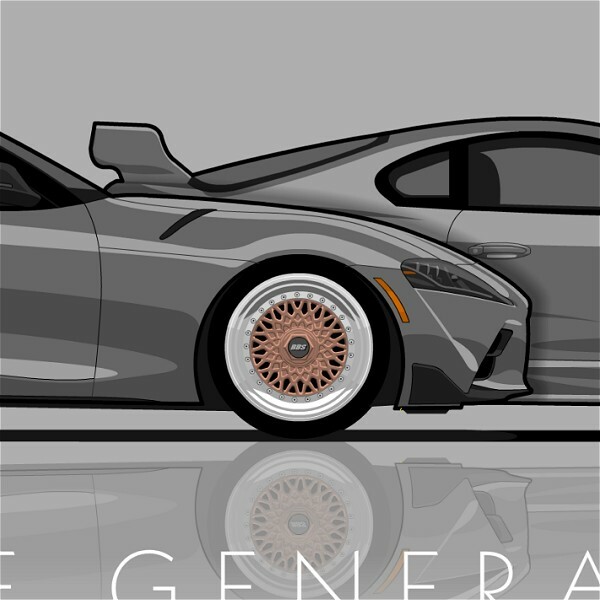 After payment for a custom commission I will contact you via email within 24 hours to discuss commission details. 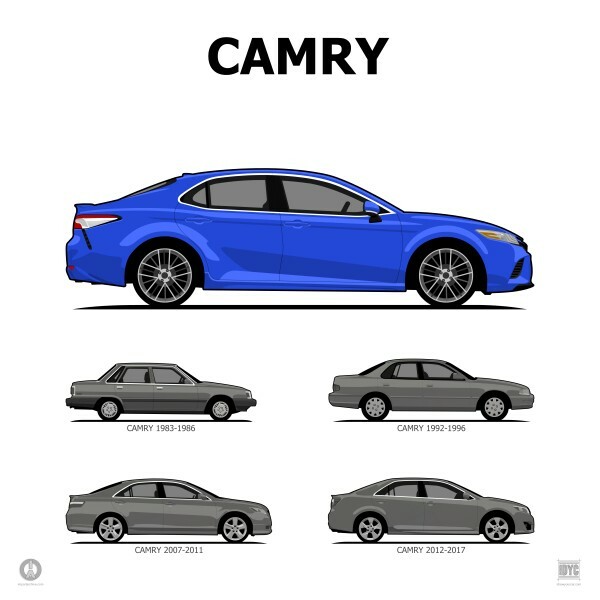 Heavily-modified vehicles may incur a surcharge to cover the extra time required to accurately detail the illustration. 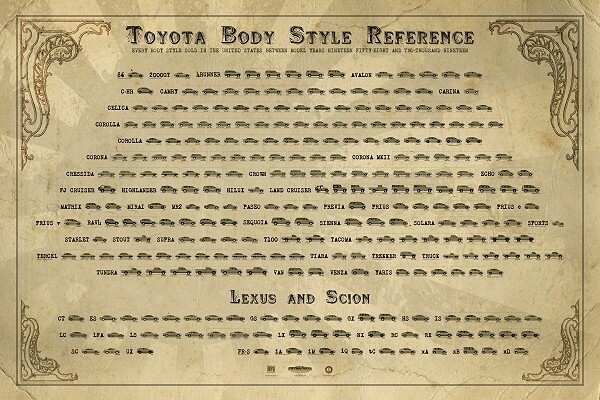 Every US-market Toyota, Lexus and Scion body style from 86 coupe to xD hatch, organized alphabetically by model and chronologically by generation, is displayed in an easy-to-read reference document that appears to have been drawn by Davinci himself. 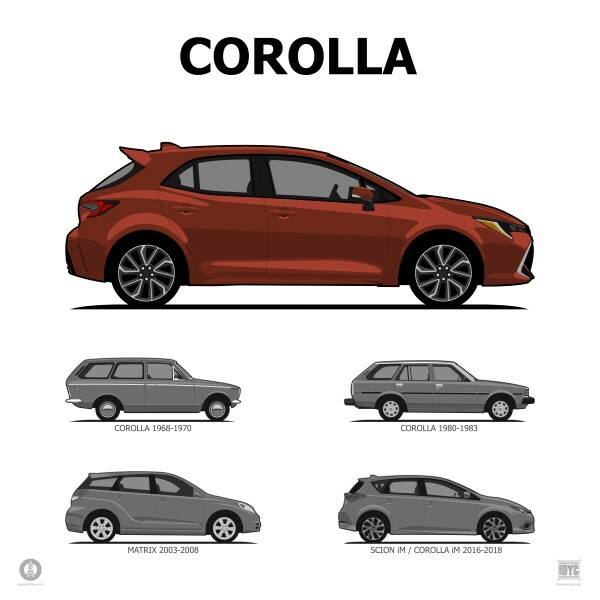 Did you know that in 1982 there were seven different Corolla body styles available on the showroom floor? 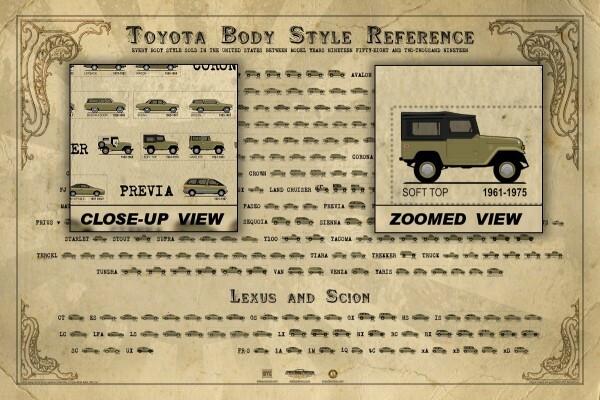 Did you know that there was a third-generation Corona two-door sedan? 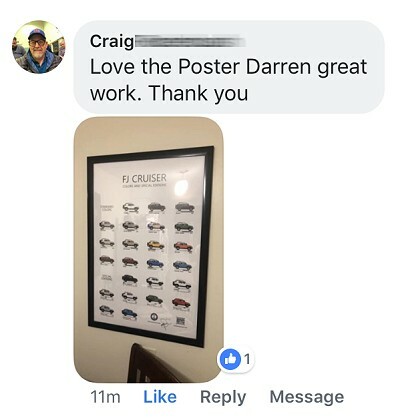 Of course you didn't because you don't have this poster! 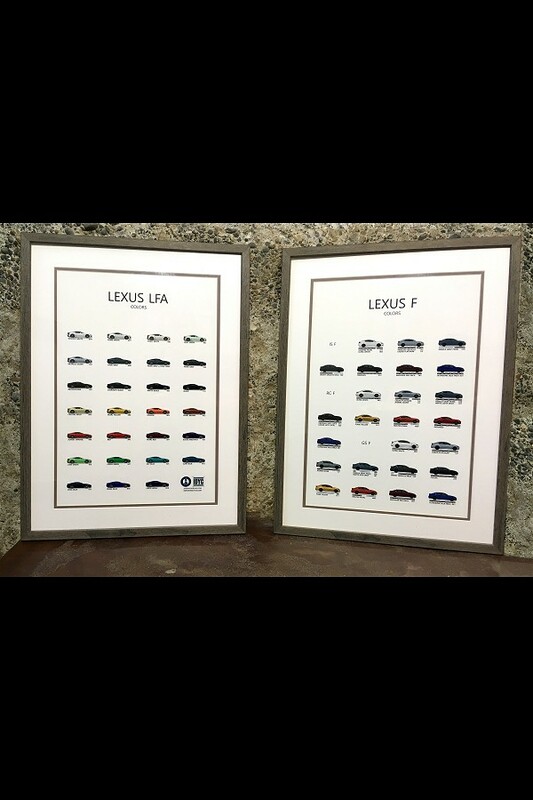 Have some empty walls that are screaming to pledge their devotion to Toyota? 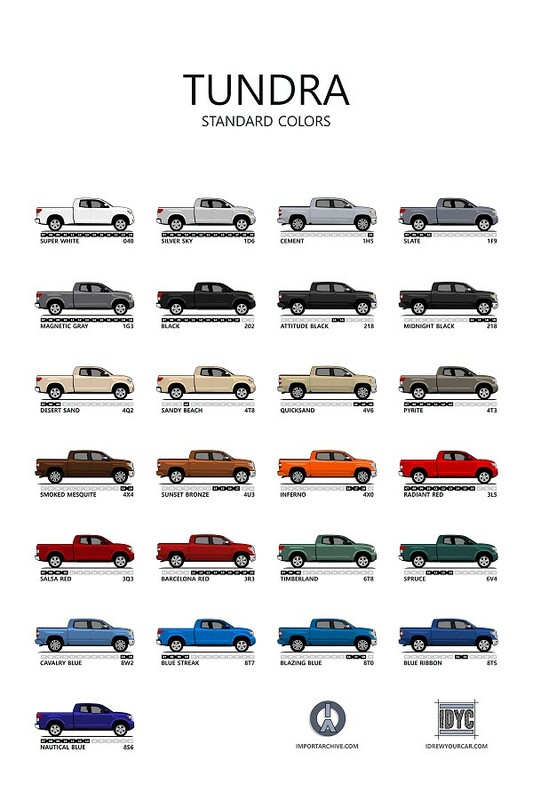 This set of 16x16ˮ prints shows the current model lineup with each vehicle featured in a different paint color. 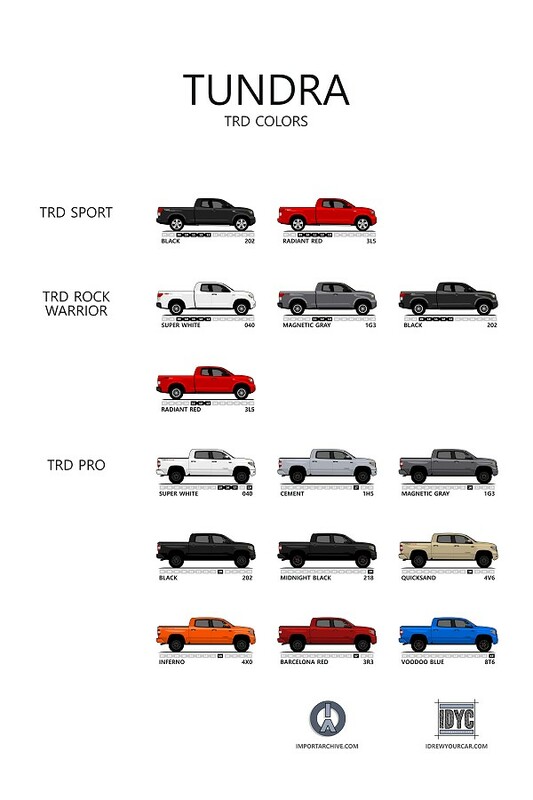 Ancestry of each model is shown below for a sense of lineage and historical significance. 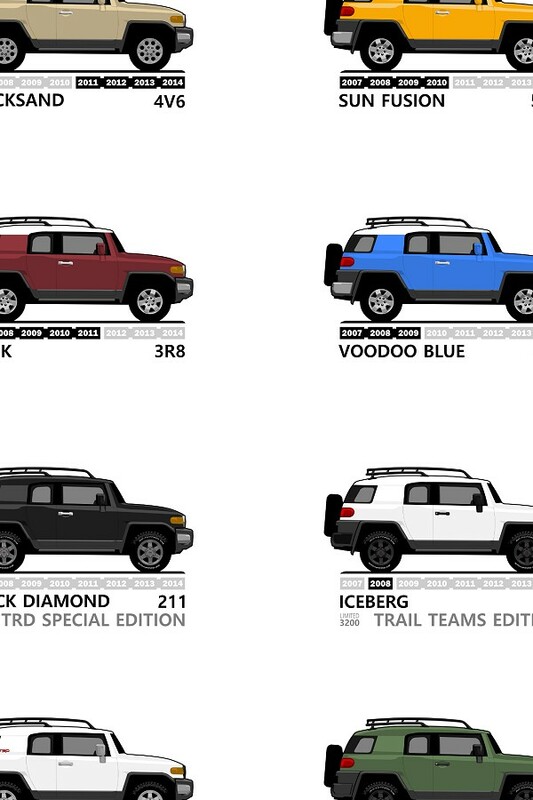 For a small additional fee this set can be ordered with the primary vehicles in any colors you wish. 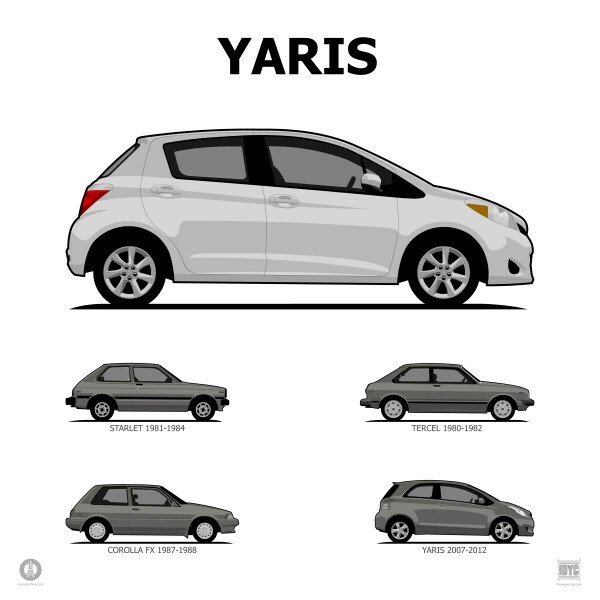 Just email for details. 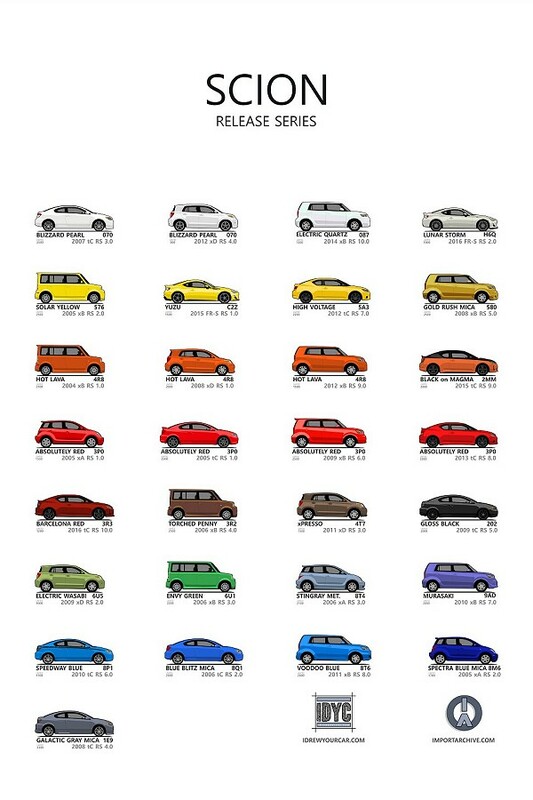 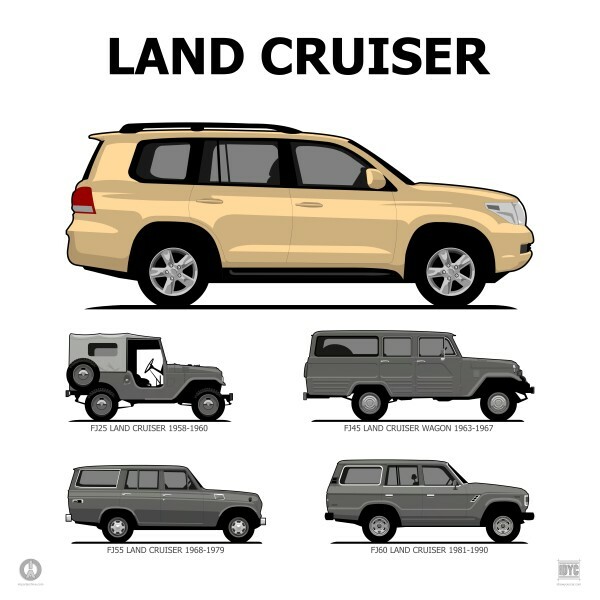 Each of the 189 illustrations on this limited edition signed and numbered poster represent a unique body variant sold by Nissan in the US-market, including Datsun and Infiniti models. 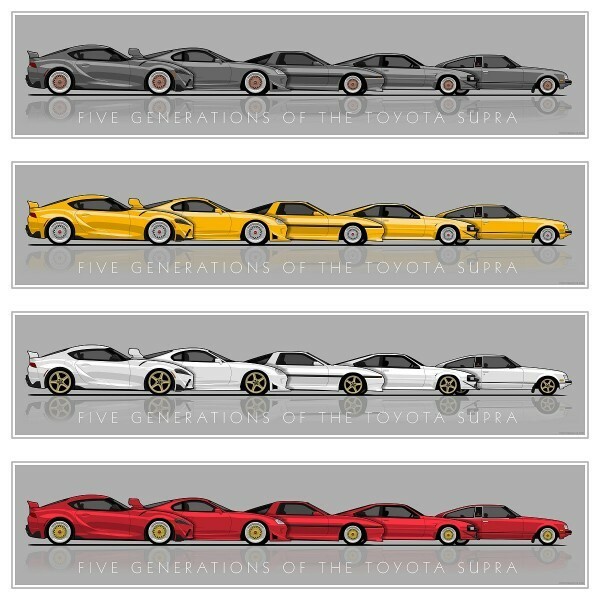 This poster will be available during the last half of 2019 and limited ONLY to those who have preordered. 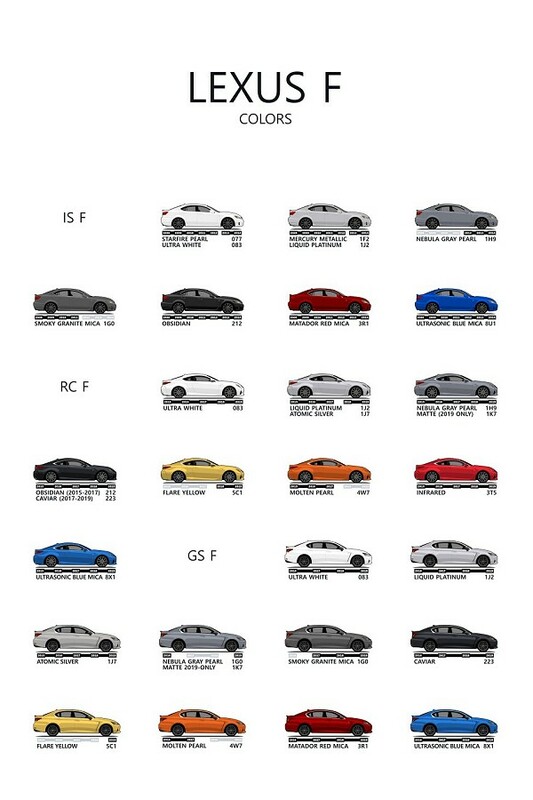 Successive print runs will be made available as Nissan releases new models. 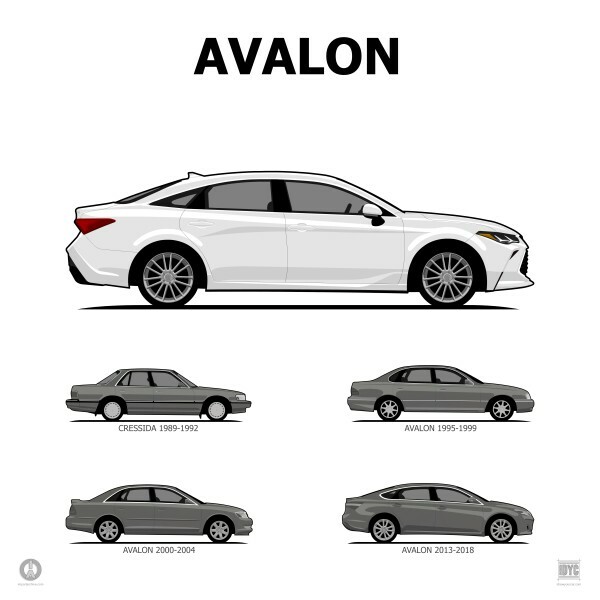 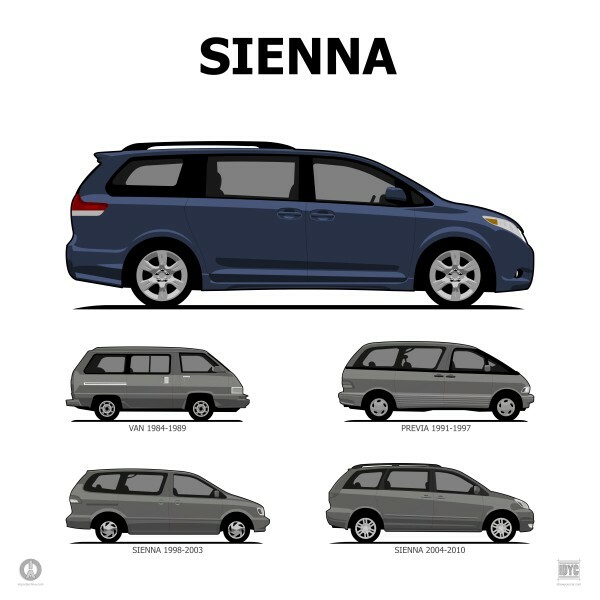 Each of the illustrations on this limited edition signed and numbered poster represent a unique body variant sold by Honda in the US-market, including Acura models. 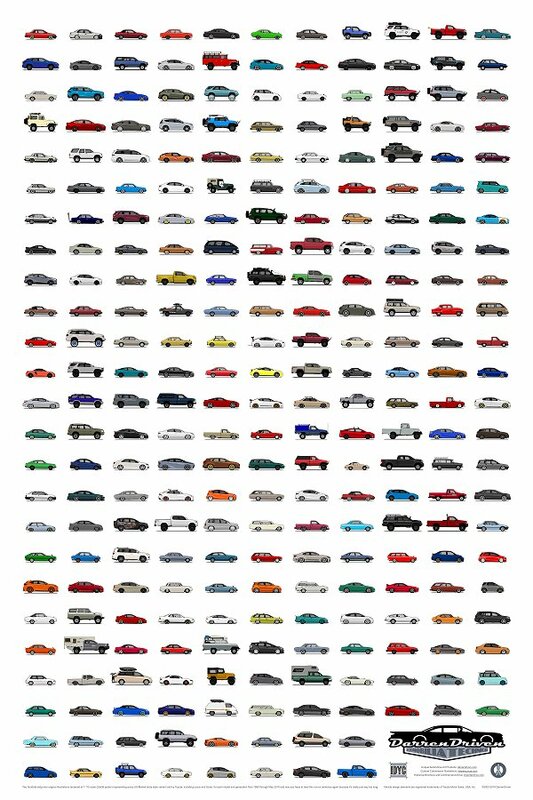 This poster will be available during the last half of 2020 and limited ONLY to those who have preordered. 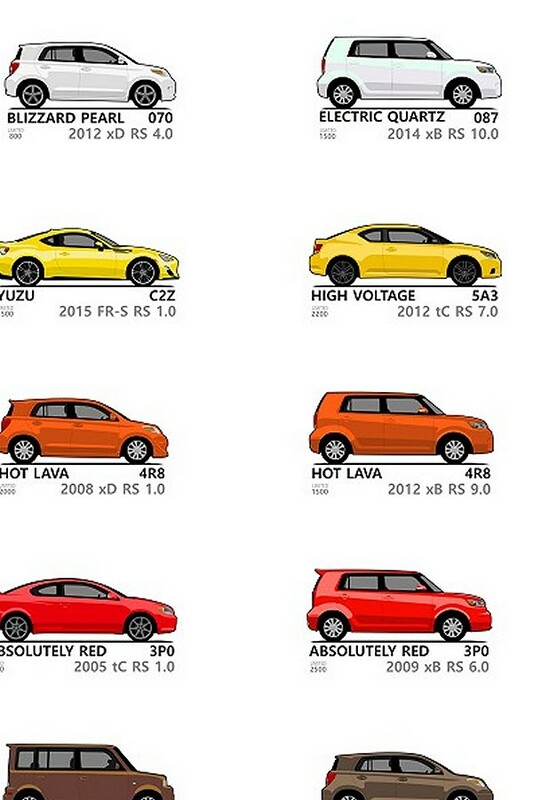 Successive print runs will be made available as Honda releases new models. 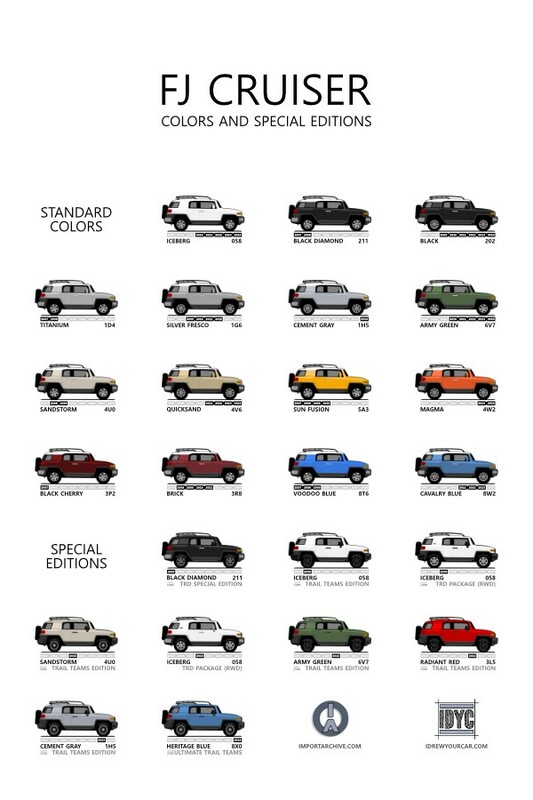 True FJ Cruiser enthusiasts have all of this memorized of course, but since I'm always mixing up the various limited editions and paint codes I made this handy tool so I'll never be wrong again. 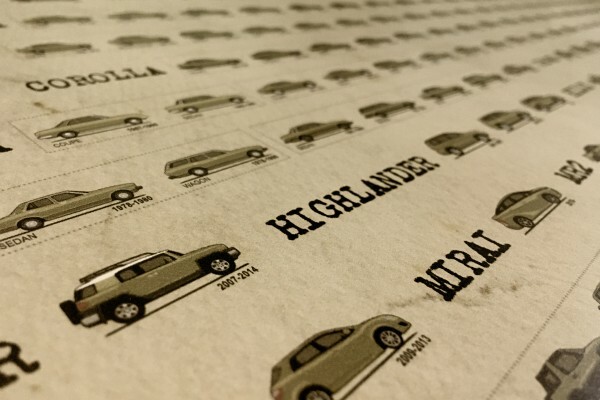 Custom poster featuring Honda Elements that will be attending the 2019 Elements on the Dragon event on 5/11/19. 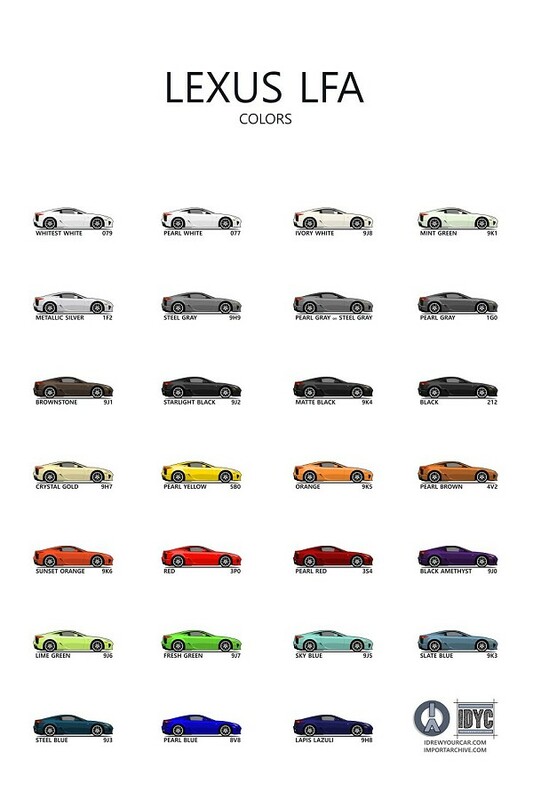 Prepurchase cut-off is Friday, April 12. 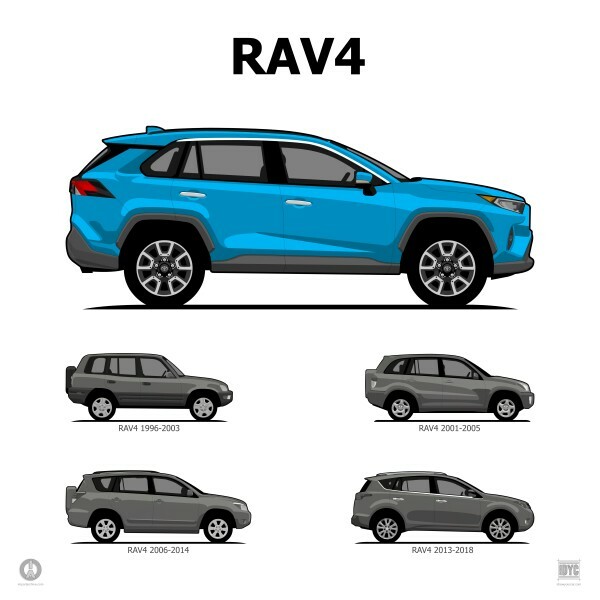 Your custom illustration will be completed within two weeks and provided to you in high resolution as soon as it is complete. 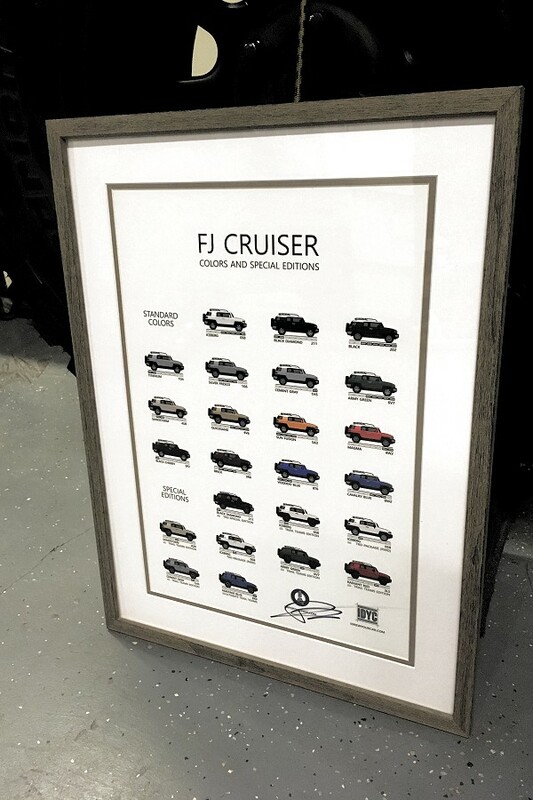 The poster will be delivered BEFORE the event takes place. 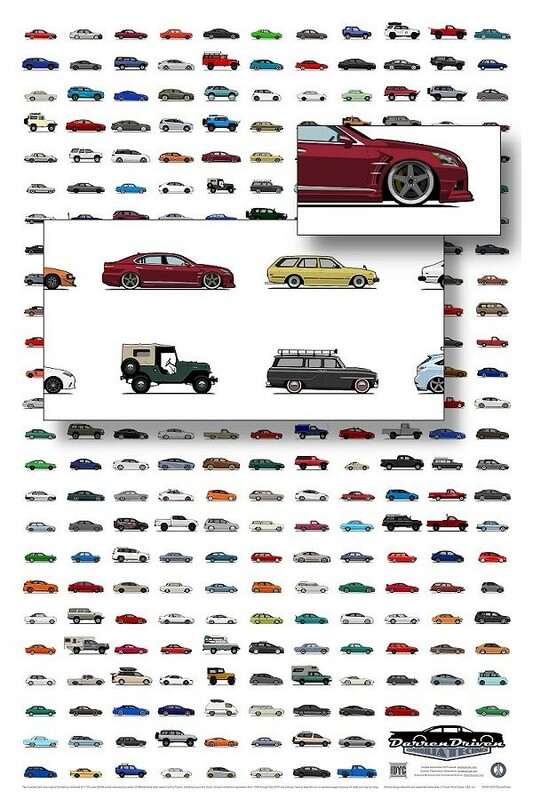 I will contact you as soon as your order is placed so we can exchange photos and illustration details.